It’s highly likely that one or two of you will be enjoying some good ol’ saucy Buffalo wings this Sunday during the Super Bowl. 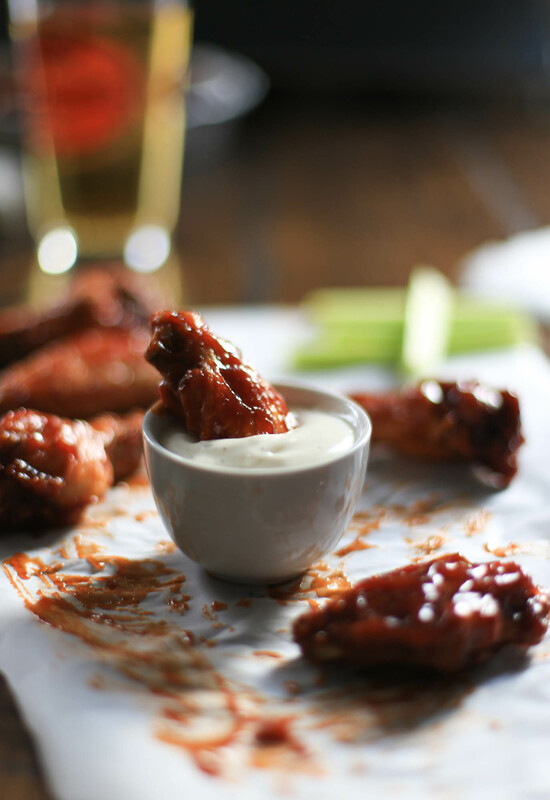 Last year Americans ate 1.3 BILLION Buffalo wings on the day of the Super Bowl. Billion. But a buffalo, as you may know, doesn’t have wings, and certainly doesn’t fly. So where did the food gets its name from? In order to not waste the chicken wings, Teressa tried something new and cut the wings in half, then deep-fried them. The wings were served with a pour of hot sauce and a side of blue cheese and celery, borrowed from the salad bar. And so began the appetizer you know and love. 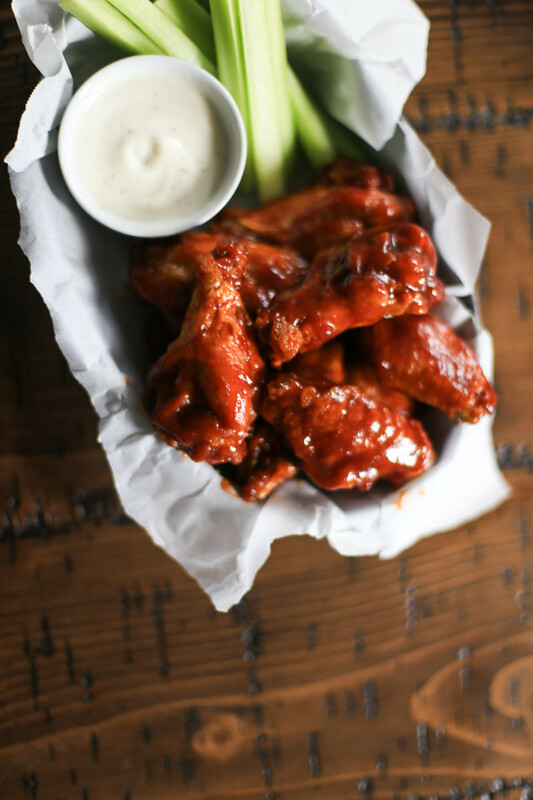 The wings were an instant hit, and their popularity quickly spread throughout the city and state so that they came to be known as…you guessed it…Buffalo wings. So truly, Buffalo wings are indeed chicken wings that have adopted a city’s name (that happens to also be a completely different animal). Now, more than fifty years later, the Buffalo wing has taken over as more and more chain restaurants picked up on the trend. Hooters put wings at the center of their menu in the early 1980s, and in the following decade pizza chains such as Dominoes and Pizza Hut starting rolling out wings as well. Any child of the 90s, such as myself, may well remember doing a double take the first time they drove past a Pizza Hut to see a Wingstreet attached to it. Now you’ve got B-Dubs everywhere (no less than 16 sauces and 5 seasonings to choose from), festivals, throwdowns, and let’s not forget the annual Wing Bowl. The current record is 429 wings in 26 minutes…perhaps you might see how we got to 1.3 billion in a day. A proper Buffalo wing is snapped in half, so that it resembles a tiny drumstick rather than a disjointed chicken wing. It is then deep-fried (without breading) and traditionally smothered in a bright orange hot sauce/butter combo – hot, medium, or mild depending on exactly how much sauce you want slathered on. The sauce that, no matter how many napkins are available, always seems to end up on an article of clothing. As for the accompaniments, according to Alton Brown the celery is really only good for the crunch in between bites of tender wings. And there is quite a divide in preference between a side serving of blue cheese or ranch – though ranch has come out on top as the most popular. Turning to 2017, and this classic American appetizer is one of the main foods eaten during the most-watched American sporting event, the Super Bowl. Who needs fancy cuisine when you can have crispy, greasy finger food dipped in hot sauce? 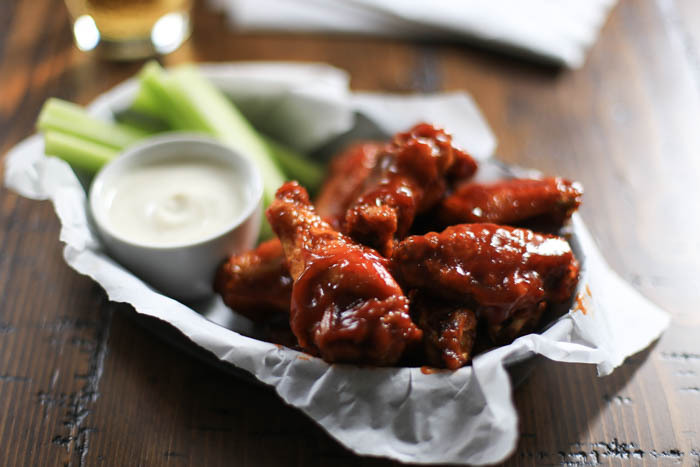 For a Buffalo wing recipe and other Super Bowl snacks, check out last year’s Super Bowl post. So – wild or mild, how do you like your wings? You can check out more Food Beginnings stories here. Also, the New Yorker article in search of Buffalo wing history is quite amusing. The Chicken texture & color is beautiful! Its Saucy & tempting. Thanks for sharing this with us.